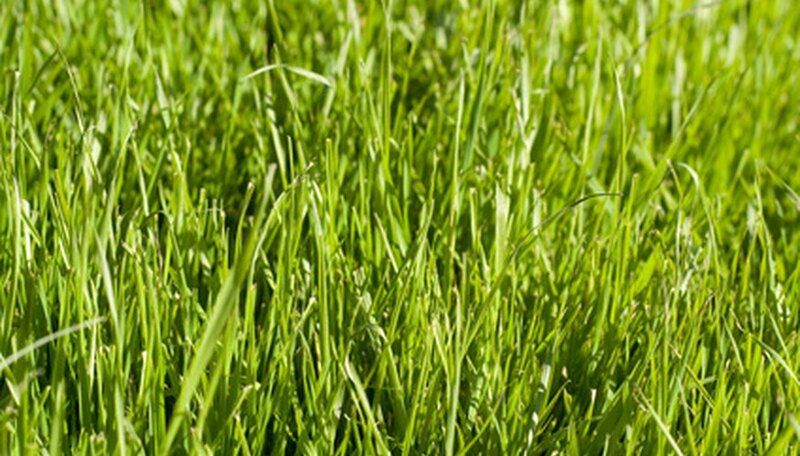 California gardeners who live in warm winter areas plant winter or annual rye grass to keep lawns green year long. Popular turf lawns such as St. Augustine and Bermuda grass can turn brown when temperatures fall below 50 degrees F. Overseed warm season lawns in autumn when daytime temperatures average around 80 degrees F and nights fall to the mid-50s. Annual rye sprouts in about one week and turns front yards emerald green. The cool weather grass thrives throughout the winter and spring. When temperatures rise, the warm weather grasses revive, and the annual rye dies back. Annual rye seed is inexpensive and readily available in garden supply stores and nurseries. Adjust the lawn mower height to medium and mow the existing lawn. Readjust the mower height to low and mow the lawn again. Reduce the grass height by more than one-half. Rake up all the clippings and put them on a compost pile or discard. Use a sturdy dethatching rake and rake over the surface of the lawn. Use vigorous strokes to dethatch the lawn, removing all dead or matted material. Discard the dry or dead grass. Open the bag of rye seed. Grab handfuls of the seed and distribute the seeds over the lawn with backhand arm flings, casting the seeds with a flick of the wrist. An 18 lb. bag will cover 1,000 square feet of lawn. Distribute the seeds evenly. Use a garden rake to disperse heavy or uneven clumps of seed. Open the bag of steer manure compost or top dressing compost. Grab handfuls of the compost and toss over the entire lawn, distributing the material evenly and lightly over the seeds. Rake gently to smooth out any clumps. Set automatic sprinklers to go on four to five times a day for about five minutes for each cycle. Set manual sprinklers so that they cover the entire lawn with the spray and turn them on four to five times during the day, depending on how high temperatures rise. Keep watering often to keep the site evenly moist until the seeds germinate--typically in seven to 10 days. Avoid walking on the lawn and keep pets and children from playing on it for three weeks. Mow the rye grass lawn after it reaches 3 inches in height.